The Geysers in northern California is the world's largest producer of geothermal power. The dry-steam field has successfully produced power since the early 1960s when Pacific Gas & Electric installed the first 11-megawatt plant. The dry steam plant consumes water by emitting water vapor into the atmosphere. The first method, which is inevitable in geothermal production, uses hot water from an underground reservoir to power the facility. The second is using water for cooling (for some plants only). Note that in some states, such as Colorado, geothermal fluid is considered a water resource, and therefore, a water right must be obtained if any of the water is to be used consumptively. See the Geothermal Regulatory Roadmap for details on how your state addresses water rights concerns. Many geothermal power plants, especially binary-cycle power plants, utilize a closed loop system that allows for the re-injection of water back into the geothermal reservoir. In a closed loop system the water is typically contained within a steel casing, and because of this there have currently been no reported cases of water contamination from a geothermal power plant. 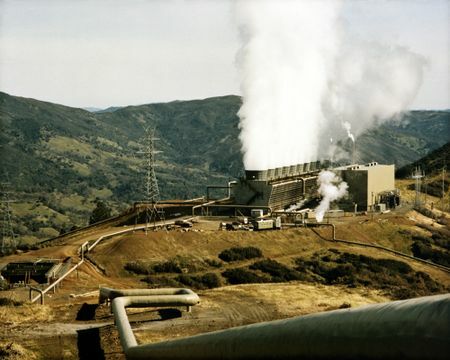 In other types of geothermal power plants, such as flash power plants, some steam enters the atmosphere, and not all of the water is re-injected back into the reservoir. In this instance, water must be brought in from an outside source to prevent the reservoir from running dry. Some geothermal plants, such as the Geysers in California, will inject non-potable water back into the geothermal reservoir, including water disposed of by others.. The power sector withdraws more water than any other sector in the United States, mostly due to cooling requirements. Geothermal is no exception, and can require between 1,700 and 4,000 gallons of water per megawatt-hour of electricity produced. The impact of water consumption can be reduced in a geothermal plant by using geothermal water for cooling instead of freshwater, or by using alternative, less water-intensive methods of cooling, such as air cooling or hybrid cooling systems. In smaller quantities, water may be needed on a temporary basis for well field development for things such as dust suppression, drilling fluid, and reservoir stimulation. Small amounts of water may also be needed for washing and bathroom facilities for the power plant. Water Use in the Development and Operation of Geothermal Power Plants Argonne National Lab, September 2010. For information about regulations and permitting related to water use for geothermal projects, see the Regulatory and Permitting Information Desktop Toolkit. ↑ 1.0 1.1 "NREL - Renewable Electricity Futures Study"
↑ 2.0 2.1 "GEA (2008) - The State of Geothermal Technology"
↑ 3.0 3.1 "NREL - A Review of Operational Water Consumption and Withdrawal Factors for Electricity Generation Technologies"